ESF undergraduate Samantha Steele applied last year for a competitive grant, usually only given to graduate students, to present her research at the 22nd Annual Conference on Ionizing Radiation Measurements and Standards. She was shocked when she heard from the selection committee. They chose her as one of nine students nationally to receive the grant. The three-day conference organized by the Council on Ionizing Radiation Measurements and Standards (CIRMS) starts March 10 at the National Institute of Standards and Technology (NIST) in Gaithersburg, Md., 25 miles northwest of Washington, D.C. There, international researchers, organizations, professors, and students will collaborate on new and improved ways of using ionizing radiation technologies to improve how materials are used and measured. Every year the conference has a theme. This year the theme is advanced manufacturing technology. "I was excited when I found out, mostly for a chance to see what other people are doing with these technologies," said Steele, a senior in the Department of Environmental Resources Engineering. Steele conducted her research under the supervision of Associate Professor Douglas Daley, Dr. Jennifer Smith and Dr. Mark Driscoll. Driscoll, who has worked with CIRMS for many years, said it was an extraordinary achievement for Steele to receive the grant as an undergraduate. "I don't know of any other undergrad that has ever gotten this award," he said. The grant program, started in 1999, covers the conference registration fees, participation in technical sessions, tickets for lunch, a barbeque dinner and a one- year membership in CIRMS. An executive committee and the winners of the prestigious Randall S. Caswell Award, which recognizes distinguished achievement in the field of ionizing radiation measurements and standards, selects the grant recipients. "We are looking forward to Ms. Steele's presentation," said CIRMS President Robert Rushton. He added that every year it is more common for graduate students to receive the travel grant than undergraduates. The CIRMS officers believe attending the conference not only gives students the opportunity to show off their work, but also to network and learn from professionals in the field, Rushton said. Rushton also explained that the selection committee keeps in mind primarily how well applicants understand the problems their research is trying to solve, the feasibility of their research plan, how well it relates to the conference topic and the future impacts of their research. 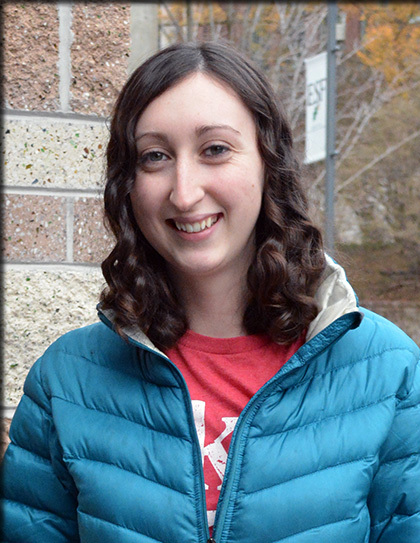 Driscoll thinks Steele's work ethic and dedication to the research she will present at the conference helped her be selected as an undergraduate. The research Steele will present at the conference involves using ionizing radiation to create a special new coating for fabrics used to prevent erosion in a variety of construction and farming projects. Steele developed ways to test if ionizing radiation can be used in this coating to prevent the erosion of small particles that are traditionally the most difficult to contain and the most environmentally damaging. Steele started coming up with ways to test the ionizing radiation coating last year when she was offered the opportunity to test the new technology for school credit with Douglas Daley, a professor in the Department of Environmental Resources Engineering, and Dr. Jennifer Smith, an assistant professor in the Department of Sustainable Construction Management and Engineering. Steele said she was at first nervous when she was given the opportunity because the testing involved using ultraviolet (UV) and electron beam technology. However, before long she found devoting herself to testing the coating was a rewarding experience, she said. Although he oversaw Steele's research, Driscoll said he often just had to unlock the door to the Baker Hall lab and turn on the ultraviolet light machine. The rest of the planning and physical testing was almost entirely planned by Steele, he added. "She really read up on this stuff," Driscoll said. Steele said she is looking forward to sharing the results of all her tests at the upcoming conference. "These technologies are super interesting to me," Steele said. "I think there is a huge market for them in the future."